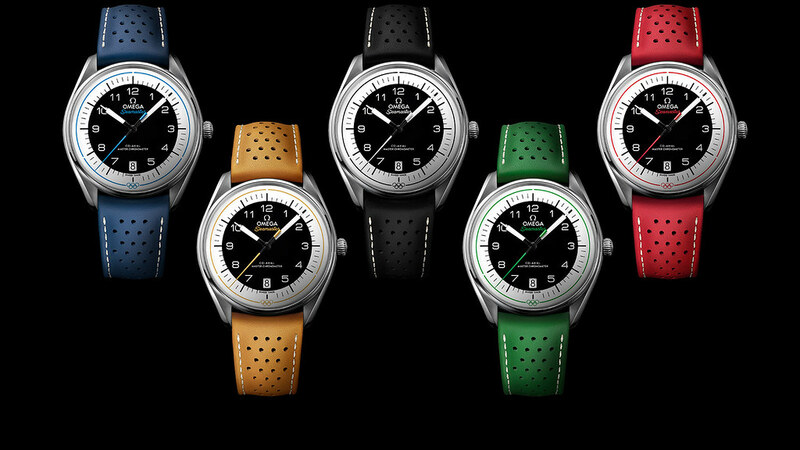 Shall I buy this series as my first Omega? I've never seen on in person so I can't base any judgement on them from first hand experience. If I were going to pick one to be my only Omega I'd probably go with the red one as it would be easy to match aftermarket straps to the watch with the red accents on the dial and second hand giving it an eye catching sporty look. Should you buy one (or conceivably all 5) as your first Omega? No. This series is not quintessentially representative of Omega at its best. This is just my opinion but these are "novelty" watches in the worst way. Garish. Obviously trying to be "inspired by" something else - a stopwatch that does not really look like them. In a way they are Omega's Calatrava Travel Time in that respect. Better choices would be a Speedmaster Professional or Master Co-axial if you want an automatic movement that is state of the art. Both versions are worthy but of course only one went to the moon (mostly). The latest Seamaster 300M Diver is state of the art both in movement and execution and is Omega's essential dive watch. It is also not trying to be anything else but an Omega dive watch. Not a Submariner, not a Fifty Fathoms or anyone else's dive watch. You could also look at the Globemaster which is a part of the Constellation line and very much quintessential Omega accurate, subtle and understated. If an Olympic watch is what you really want look at some of the older (used) and more subtle limited edition watches such as the Speedmaster Mark II Rio 2016 or Seamaster 1948 London 2012. As always though this is just one persons opinion and not the one spending the money. That was an excellent summary of the Omega line up. I don't mind the Sochi Planet Ocean too. I like the newer PO's better. Thank you for your kind words. I had forgotten about the Planet Ocean Sochi Edition. Also very subtle and it is the only Cal.8500 Planet Ocean with a solid case back which makes it doubly special. The newer Master Chronometer Cal.8900 Planet Ocean Olympic watch is not as subtly done on the red and blue rubber strap but on the bracelet included in the purchase it looks very good and far less obviously a limited edition. There are stil some available at ADs as well so the OP could get one perhaps even with a discount. It would also lose value far less than the Stopwatch collection being considered as Planet Oceans are perennial sellers and always in demand. Tried the blue and green versions yesterday but both didn't smile at me, firstly its 39.5 mm case looks too small on my wrist, secondly it's quite light so it feels like wearing a Swatch watch. Next Topic: I've been away too long..and I need some help.